After max capacity has been reached, an online waitlist will be generated. In order to be on the waitlist, you MUST register online. Any cancelled booth spaces will be offered to those on the waitlist in sequencial order. ONLY ONE TRADE SHOW BOOTH SPACE REMAINS! BOOK TODAY TO AVOID DISSAPPOINTMENT! 1. The Exhibitor agrees to abide by all rules and regulations adopted by Kamloops Exploration Group Conference & Trade Show and Kamloops Exploration Group Conference & Trade Show will have the final decision in adopting any rule or regulation deemed necessary prior to, during and after the show. 2. The exhibitor agrees not to sublet or share the space(s) unless written authorization is provided by Kamloops Exploration Group Conference & Trade Show. 3. All additional equipment other than the pipe and drape back and side walls, 1x 6’ skirted table, 2x folding chairs, 1x 750 watt electrical outlet, all additional equipment can be ordered and supplied at the exhibitor’s expense through the Kamloops Exploration Group Conference & Trade Show chosen contractor Showtime Event & Display. 4. The Exhibitor will hold the Kamloops Exploration Group Conference & Trade Show and the owners of the buildings and grounds harmless from any damage or liability arising from any injury or damage to said Exhibitor, his agents, servants or employees, or to the property of the said Exhibitor occurring in the buildings or grounds or the approaches and entrances thereto, except by negligence of Kamloops Exploration Group Conference & Trade Show. 5. The Exhibitor will have the right to cancel his/her reservation for space until March 15, 2019, in which case he/she will be charged a $25 administration fee. Should the Exhibitor cancel his/her reservation after March 15, 2019, he/she will be liable for the total amount of the payment. All cancellations must be confirmed to Kamloops Exploration Group Conference & Trade Show in writing, and the effective date will be the date the notification is received. On notification of cancellation, Kamloops Exploration Group Conference & Trade Show will be free to relet the space(s). 6. In the event the Exhibitor fails to comply in any respect with the terms of this agreement, all rights of the Exhibitor hereunder will cease and terminate. Any payment made by the Exhibitor on account hereof will be retained by Kamloops Exploration Group Conference & Trade Show as liquidated damages for breach of this contract and Kamloops Exploration Group Conference & Trade Show may thereupon re-let the space. 9. Kamloops Exploration Group Conference & Trade Show reserves the right to reject or prohibit exhibits or Exhibitors or to relocate exhibits or Exhibitors when in Kamloops Exploration Group Conference & Trade Show opinion such moves are necessary to maintain the character and/or good order of the Show. No monies will be returned to Exhibitors under these conditions. 10. The Exhibitor’s property will be placed on display and exhibited at his/her risk and Kamloops Exploration Group Conference & Trade Show assumes no responsibility for loss and damage thereto. The Exhibitor will assume all responsibility for loss of damage to his property due to fire, theft, flood, lightning, earthquake, explosion, or any other cause beyond the control of Kamloops Exploration Group Conference & Trade Show. 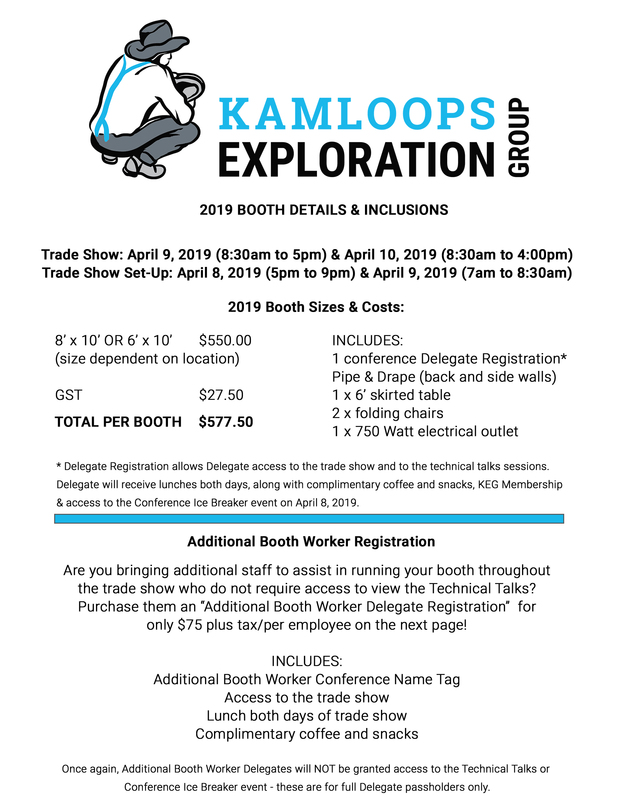 Kamloops Exploration Group Conference & Trade Show will have hired security guards to monitor booth space areas during the duration of the conference (day and night). 11. All goods shipped to the Show must be pre-arranged with Showtime Display & Events. Goods must not be shipped to arrive before the scheduled move in date. Kamloops Exploration Group Conference & Trade Show assumes no responsibility for loss or damage to good before, during or after the Show. 13. The exhibitor agrees that no display will be dismantled or goods removed during the entire run of the Show and the display will remain intact until the closing hour of the last day of the Show. 17. The Exhibitor agrees to maintain qualified personnel in the display at all times during the Show hours. Kamloops Exploration Group Conference & Trade Show will not assume any responsibility for losses or damages incurred from pilferage or any other causes. Exhibitors should take all possible precautions to protect their own property, including insurance if deemed necessary. By continuing to the registration page, it us understood that you have read and agree to the above Terms of Agreement.